Pasta in general terms is usually considered to be an extremely healthy, low fat eating option. It is often vegetarian friendly, it serves as an ideal accompaniment to the delicious and nutritious fresh ingredients otherwise incorporated in the Mediterranean diet and it is quick and easy to prepare. The problem with regard to fat in pasta dishes arises not from the main ingredient itself but what is often added to it, particularly in relation to sauces. Cheeses and cream are perhaps the most frequent culprits when it comes to introducing saturated animal fats in to what are otherwise generally low fat dishes but neither will be found in any of the recipes on this page. All the pastas used on this page are of the type which have been made and dried before being sold. Pasta will on most occasions be cooked by submerging it in boiling, salted water. It is important to have plenty of water in the pot and to have the water well salted. It is the perceived excess of water which keeps the different strands or pieces from sticking together by ensuring the sticky starch becomes well diluted. There is a popular belief in Italy that the water for cooking pasta should be as salty as the Mediterranean Sea. It is also important not to overcook it that it becomes soggy and mushy. The popular Italian description for perfectly cooked pasta that is al dente means literally, "To the tooth". This suggests that there should remain some bite to it and that it will require to be chewed before it can be swallowed. The cooking period will vary depending upon the type being cooked and the strength of the simmer but allow for eight to ten minutes in most instances. The inclusion of a soup recipe on this page may raise an inquisitive eyebrow or two for a couple of principal reasons. Firstly and most significantly, soup is rarely considered to be a quick dish to prepare. Soup usually takes several hours or even overnight to prepare properly. In this instance, the soup is on the table less than an hour after its preparation is started. Secondly, pasta is not usually considered a common soup ingredient. Italian minestrone soup is a soup, however, which does not have a hard and fast recipe. It is better described as being a concept, one which incorporates whichever fresh vegetables happen to be in season at the time. One of the popular further additions is pasta. When preparing large garlic cloves like these, it is a good idea to remove the tough, indigestible inner stalks. This is done by peeling the clove and cutting it in half down through the middle. The stalks can then be popped free. See the photo above. Bring the olive oil up to a medium heat in a large soup pot. Add the garlic, onion, carrot and celery and saute gently for a couple of minutes, stirring with a wooden spoon. Pour the tomatoes and the vegetable stock in to the pot. Season, stir well and bring to a gentle simmer for fifteen minutes. Add the drained and rinsed borlotti beans and the fusilli to the soup, stir and bring back to a simmer for a further ten to twelve minutes. Taste the soup and adjust the seasoning if required before ladling in to serving bowls and serving with the fresh ciabatta. Bring a large pot of salted water to a rolling boil and add the tagliatelle. Simmer for ten to twelve minutes. A couple of minutes before it is ready, put the olive oil in to a small frying pan, heat and saute the garlic for around a minute. Add the olives, sun dried tomatoes and basil, simply to heat through. Season with salt and pepper. Drain the tagliatelle well before adding it to the frying pan and combine with the veg by lifting and folding with cooking tongs. Transfer to a serving plate or bowl and garnish with the sprig of basil. Put the spaghetti in to a deep pan of salted water to simmer for ten to twelve minutes. Heat the olive oil in a frying pan and season the chicken slices. Fry for two minutes each side until cooked. Add the garlic, mushrooms and rosemary to the frying pan and stir fry for a minute. Drain the spaghetti and add to the frying pan. Toss and combine with the other ingredients. Plate the pasta and accompaniments, garnishing with the half sprig of rosemary. 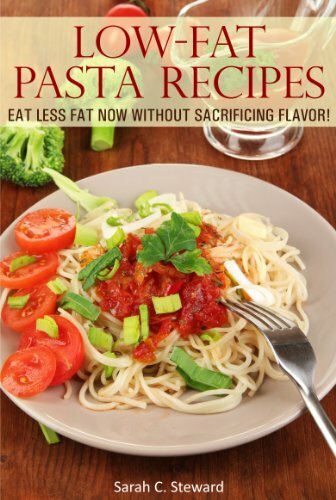 Low-Fat Pasta Recipes: Eat Less Fat Now Without Sacrificing Flavor! Low fat pasta recipes come in an endless variety of potential forms and this bargain little 52 page e-book will considerably enhance your repertoire. Available for immediate download to Amazon Kindle or any other e-reading PC or device. Smoked salmon and strawberries is not an unheard of combination but it will be unfamiliar to many people. It is also one of those food combinations which people tend to either love or hate so you may find it a good idea to try it in a small quantity before including it in a full scale meal. Do note that the lemon juice is essential to cut through both the sweetness of the strawberries and the oiliness of the smoked salmon. Simmer the fusilli in salted water for ten minutes. Drain well, cover and leave for at least fifteen minutes to cool completely. Put the spirals in a large bowl and add the smoked salmon, strawberries, basil and lemon juice. Season with black pepper. Combine the ingredients by stirring in a lifting, folding motion with a wooden spoon. Plate the combination and serve with the cold beer. The beer is not just a "nice to have" accompaniment to this dish, it really does add something special to the taste of the meal and the eating experience. It used to be the case that eggplants and aubergines had to be salted and left for a while before they could be cooked. This was to allow the salt to draw the bitter juices from the flesh. In modern times, this bitterness has largely been bred out of the vegetable and the procedure is only absolutely necessary if using a heritage variety. However, it remains a good idea to follow the process where time permits in order to draw out excess moisture and prevent the veg becoming soggy as it cooks. Put the diced eggplant and zucchini in to a large bowl. Season fairly well with salt and stir carefully. Pour the vegetables in to a large sieve and suspend the sieve over the bowl. Cover with kitchen paper and leave for half an hour. Put the olive oil in to a large pot, heat and saute the garlic for a minute or so. Give the sieve a final shake and tip the vegetables in with the garlic. Season with pepper only and saute for a further minute. Pour the tomatoes in to the pot and bring to a simmer. Leave to simmer, stirring occasionally, while you tend to and cook the pasta. Put the penne in to a large pot of salted water and simmer for ten to twelve minutes. Drain well before adding to the sauce with the chopped parsley. Stir well before dividing between two serving bowls and garnishing with the remaining parsley. This quick to make bruschetta is simply toasted slices of ciabatta bread, rubbed with the lightly crushed garlic clove, drizzled with extra virgin olive oil and seasoned with salt and pepper. It works very well as a simple accompaniment to this dish.